Eat Your City: Best customized pancake recipes... eggnog, lemon ricotta, carrot cake, pumpkin pie fruit and more pancakes! Part 2 of Breakfast and brunch series! Best customized pancake recipes... eggnog, lemon ricotta, carrot cake, pumpkin pie fruit and more pancakes! Part 2 of Breakfast and brunch series! 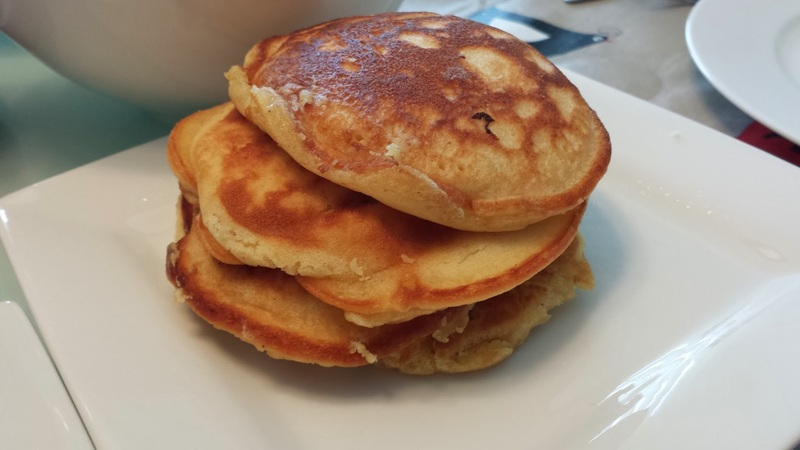 Posted by One of my favorite items for breakfast or brunch is pancakes! Well, so are Eggs Benedict, and we covered how to poach eggs and make Hollandaise sauce in part one of the Breakfast and Brunch series. And if you haven't figured it out, I really love eggnog. I portion and freeze eggnog so I can have it year round in my sweet potato casserole recipe, or to add randomly to stuff when I'm baking and in the mood for more eggnog-y goodness! So when my girlfriend and husband suggested and did add eggnog to their pancake mix instead of milk... they're geniuses in my eyes! Using eggnog instead of milk gives any pancake recipe incredibly fluffy, soft, moist pancakes (more so than usual) and with the bonus flavor of nutmeg and cinnamon... mmmm! 3) Pour the wet mixture into the dry mixture and stir together, just until the lumps are gone. 4) Spray skillet with non stick cooking spray and place on medium heat. Pour pancake batter onto skillet in 1/4 cupfuls. 6) Flip with a spatula and cook for another 1-2 minutes until golden on the bottom side too. -go big or go home.. make Chantilly cream top top these babies off.. Chantilly cream recipe here! -drizzle with butter caramel sauce... scratch butter caramel rum recipe here!